I'm a lifetime dieter. I gain weight super easy, especially from stress. Losing weight is another matter. I think the main problem is taste. It always seems that if anything tastes really good then it must be fattening. So I am constantly looking for low fat, low cal food that I can make that tastes good. There are many many delicious recipes out there that fit the bill. But many of them though just taste bad. No offense to the creators but I have tried some really awful recipes that looked good on paper but tasted horrible. One thing that had eluded me for such a long time was salad dressing. I am not a huge fan of plain oil & vinegar. I much prefer creamier dressings like Caesar or ranch or blue cheese. So I started hunting for one that didn't taste like puke (sorry I had to say it). I found one that was palatable, barely. It was made with yogurt. It still had a funny taste to it though that really made eating salad more of a chore than something that should be enjoyed. Not to mention the cost...a rather small bottle is $3.99 or more. I decided to experiment and see what I could come up with. What I got is lean and green. It's not fat free but the fats it has are good for you fats and should be eaten no matter what diet your on. I started with a package of Hidden Valley Ranch. The directions tell you to use 1 cup of mayo and 1 cup of milk. You could use fat free mayo but OMG have you ever tasted it? Its horrible. Same goes for the low fat version. Mayo or Aioli should be eaten in all its full fat glory or not at all. So in order to make this dressing low fat I used a GOOD, fat free, Greek yogurt, like Fage, in place of MOST of the mayo. Or better yet make your own but that will be another post. 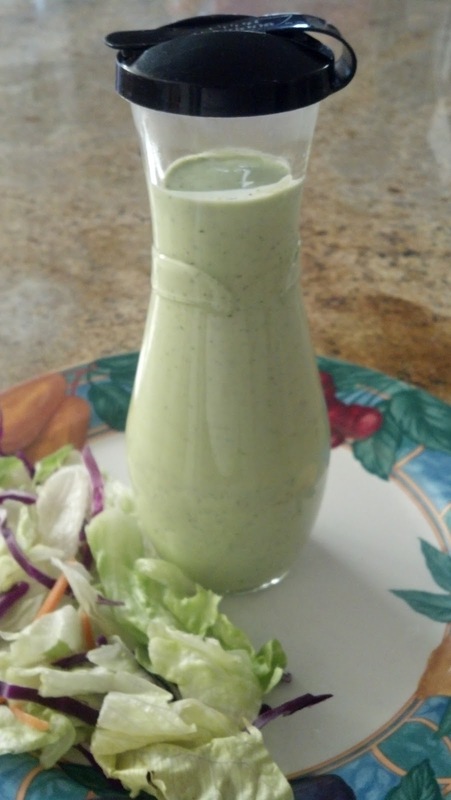 Add all the ingredients into a blender or food processor and whip up a delicious dressing. If you would like to make a dip then add the milk a little at a time until you get your desired consistency. You can make this dressing completely fat free by omitting the mayo and avocado but for me they take some of the sourness out of the yogurt and give the dressing a creamier texture. Another thing you can do is make a faux guacamole dip. 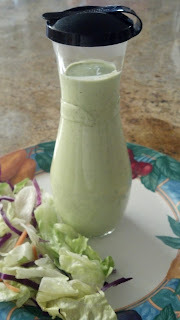 Just omit the milk and mayo, add another 1/4 avocado and blend. Place in a bowl, toss in diced tomato and diced red onion. This is the perfect dressing for Wingin It. It gives you a lot of room to play. You can add as much or as little of the lime, cilantro or cumin. Add black pepper or jalapeno for a kick. It's all about the taste.